Square is the new cool - Next to your sparkling conversation, your business card tells new contacts who you are, so it’s got to be a showstopper! 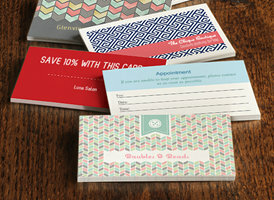 Square Cards are different - Perfect for a product, service or portfolio. These cards are proof you’re a “think outside the box” kind of professional. These cards never get tossed they are a luxury product, through and through. ​Incredibly high quality business product that looks and feels fantastic. It’s a D-Luxe, tactile experience; a truly unspoken sign to your customers, showing you care. Simply the finest paper stock made. Four layers of sumptuous Mohawk Superfine merged together to create the ultimate Square Business Card. Square Business Cards: Hand them out to stand out! Be different - Be bold! 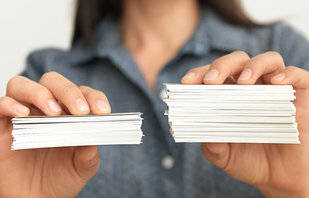 The heavy hitter Our double-thick business cards make a big impact…on everything but your budget. Thicker, stronger feel. Our sturdy, 400-lb. stock is a real handful. As thick as a credit card and super smooth to the touch, you’ll feel the luxury the second it’s in your hands – and everyone else will too. Smooth, bright paper. Your logo and text will stand out in contrast. Extra heavy stock also means increased durability and toughness, so you can say goodbye to creasing. ​Metal Cut, Embossed, & Printed Shape Cards: A Powerful First Impression! !!! Exciting New Materials For Business Cards !!! Black metal | Copper | Brass | Carbon Fiber - Prices & Info Coming Soon! ​3D Domed Acrylic Labels Standard or Metallic Base makes you Standout! Add Depth To Your Brand Draw attention to your corporate or product name with dimensional and full-color Dome Logo Labels. The words and designs literally rise above the surface, providing an eye-catching label that begs to be touched. Letters also can be die cut and individually pre-spaced. Available in a wide variety of finishes including rich wood grain, mirror chrome, printed and colorized, leather or foam. Self-healing, these customized polyester designs are beautiful yet durable. 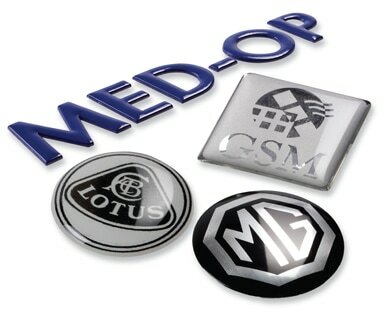 They attach with a permanent adhesive.Dome Logo Labels are a great alternative to nameplates.